The trip from the Chicago area to the Twin Cities takes us that final 200 miles north that usually means snow on the ground, ice on the lakes and a return to cold temperatures. But not this year! 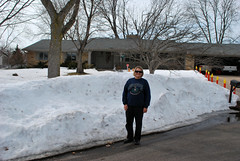 We had temperatures around 80 degrees during most of Saturday, even coming up our driveway. Last year, snow. This year, on the same date, no. Wisconsin means dairy farms. The eastern part of the state is dotted with them. There are plenty also in the western part of the state but there are also signs that remind us of the pineries that once stood here. 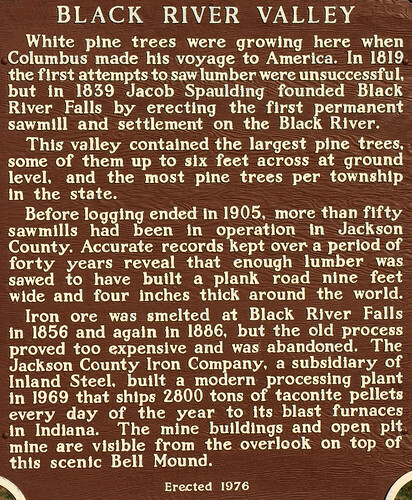 The loggers from Maine moved westward cutting the timber in Michigan, Wisconsin and then Minnesota before the industry moved out to Oregon and Washington. The descendents of some of the lumberjacks that gave up the trek west still have an entrepreneurial spirit and have small businesses along the Interstate. 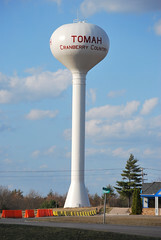 Here at Tomah, a Cranberry center, there aren't just gas stations and restaurants. 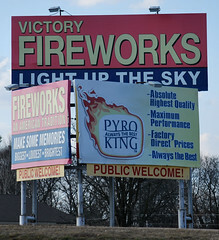 You'll also find a shop or two selling cheese and others in the very seasonal Fireworks business. 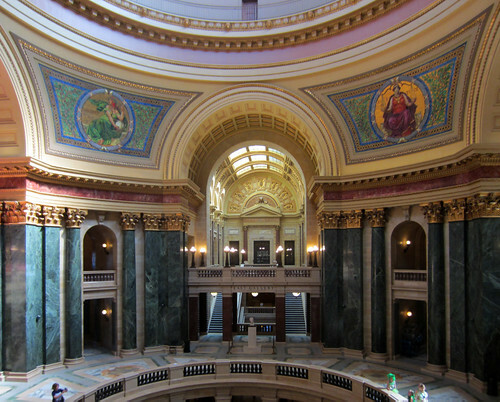 On Saturday morning we left Kenosha and headed for Madison to photograph the state capitol. Madison did a great job laying out their capital city. They put the building at the center of four city block plot of land, then oriented it with four wings lying diagonally versus the nearby streets. 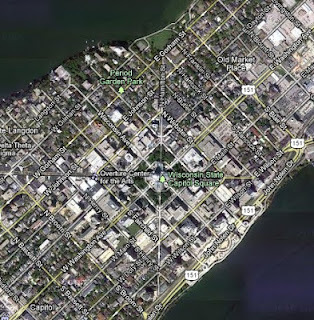 They extended the wings via four diagonal streets and put the whole layout on an isthmus in between two lakes. Click on the image and Google should take you to the right spot. 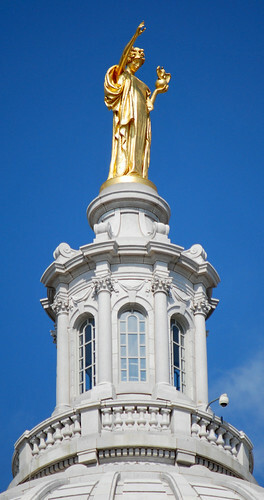 There is no gold dome, but the there is a statue on the top named "forward," the state's motto. The inside of the building is particularly nice. Maybe in the top two or three of the 37 that we have seen. 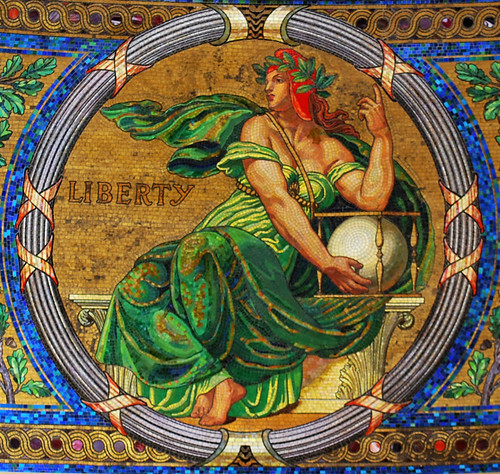 A copy of the Wisconsin State constitution and a replica Liberty Bell are on display, but the four mosaics just below the dome really stand out. ...four panels of glass mosaic works designed by Kenyon Cox, for a total cost of $20,000. Kenyon Cox, born in Warren Ohio, (1856 - 1919) was an important American painter, draughtsman and art critic. 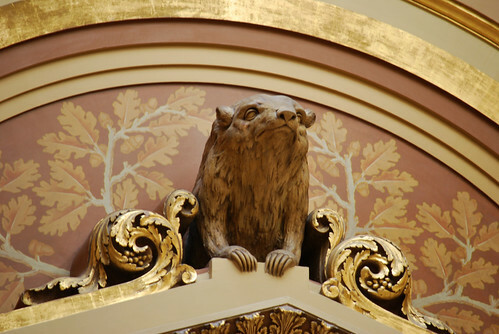 He also painted murals for the Library of Congress and the Capitols of Iowa and Minnesota. Take a closer look at each of them. No history book discusses Wisconsin without mentioning Governor Robert La Follette (1855-1925) and the Progressive Movement. 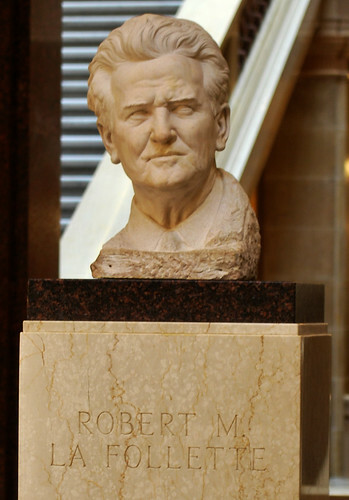 There is a large bust of La Follette in the rotunda. And say, isn't that a badger up where we can barely see it? 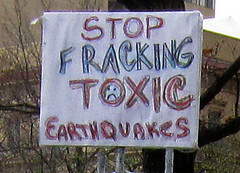 I expected a lot of protesters from the "Occupy" movement or from the "Recall Walker" effort. But we had arrived on Saint Patrick's Day, a Saturday, and a March day with temperatures in the 80's. If there were any protesters around, they were lost in the crowd. 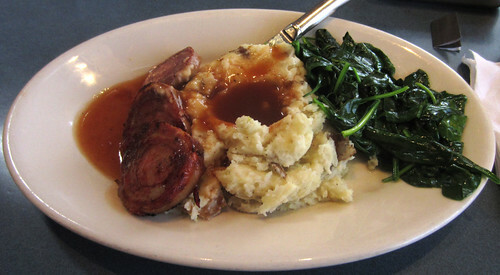 Since Madison is a college town, there are plenty of restaurants to try. We settled on Bluephies on Monroe Street. I had the Wisconsin Sushi. Wisconsin Sushi? Well, here's the description from the lunch menu. Today was "heartland" day on the trip home. We stopped yesterday to spend the night in Lima, Ohio. We had been coming west from Mount Gilead along U.S. 30 and "Miss Garmin's" instructions took us along Bluelick Road, Sugar Street and Bible Road to our hotel. It was only when I sat down to blog tonight that I realized I should have taken a few pictures in Lima. Lima has a current population of around 39,000. The population had peaked at about 54,000 in 1970. The drive along those back roads took us past a huge Ford Motor Company engine plant, the U.S. Plastic manufacturing facility (with a retail store) and, appropriately in the middle of those, the Lima Pallet Company. In 1906, an average of 143 trains and 7,436 cars, carrying 223,080 tons of freight, passed through Lima every 24 hours. In addition, 49 steam and 28 electric trains landed passengers in Lima daily. A new "super power" design, introduced in 1925, enabled Lima to capture 20% of the national market for locomotives. The "super power" locomotive was created by mechanical engineer William E. Woodard. Designed to make more efficient use of steam at high speed, it became, in the words of railroad historian Eric Hirsimaki, "one of the most influential locomotives in the history of steam power." Later years saw the introduction of the Chesapeake and Ohio Railway 2-6-6-6, one of the largest locomotives ever built, and the glamorous Southern Pacific "Daylights," designed to complement the Pacific Coast scenery. Had I bothered to read this last night, you would be looking at a photo of the last steam locomotive built in Lima. Instead, all I have to offer is this link to someone else's blog. 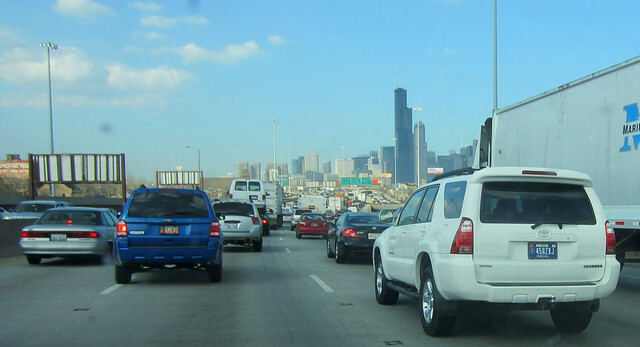 By early afternoon we had paid several tolls, passed through gritty Gary, Indiana, and passed under the sign that said, “WELCOME TO CHICAGO -- RAHM EMANUEL, MAYOR” The next hour was spent looking at traffic with the city as a backdrop. One of my sisters-in-law called us today and wondered if we were taking restaurant suggestions from Guy Fieri's, "Diners, Drive-Ins and Dives." Well, no. But what an excellent suggestion! 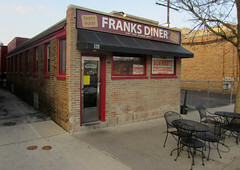 We immediately inserted the location of Franks Diner in Kenosha, Wisconsin, into Miss Garmin's memory bank. While the temperature had been in the low 80's in Indiana and 70's in Chicago, it was only 46 degrees as we pulled up to the waterfront in Kenosha. I was a bit frosted, too, by the $4.259 price of gasoline in Illinois so I waited until we hit the State Line Citgo station where I filled up the tank with $3.999 stuff. Never thought I'd be happy to see $4 a gallon gas. 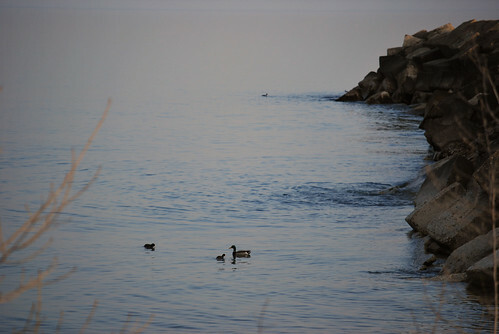 The view in Kenosha offered water, fog and ducks. Quite a contrast to the Dan Ryan Expressway. We drove up the beautiful Lakeshore Drive (or Lack-a-shore drive as Ms. Garmin pronounces it) to reach Frank's Diner but found it closed. We would have to find another Diner or Dive. We soon located the nearby Marina Garden Restaurant. The "COCKTAILS OPEN 24hr" sign suggested that it might qualify for Fieri's program. We had good food at reasonable prices. Like many other seafood restaurants, especially on the Gulf Coast, they had several Greek meals on the menu. Gyros and Spanakopita were both very tasty. Service was very good. And we knew that we were almost home. This was Friday, and the special was AYCE fish fry. 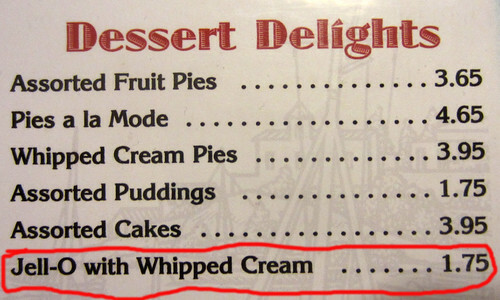 And to top it off, check out the dessert options! Today was another visiting day. 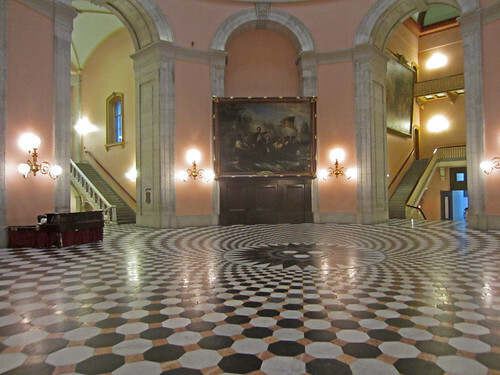 After photographing the capitol building in Columbus we drove up to Mount Gilead to visit a friend. 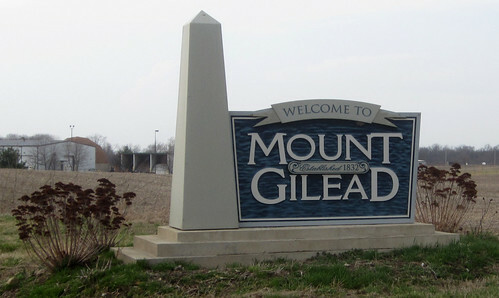 Mount Gilead is a town of about 3000 located in central Ohio and is the county seat for Morrow County. 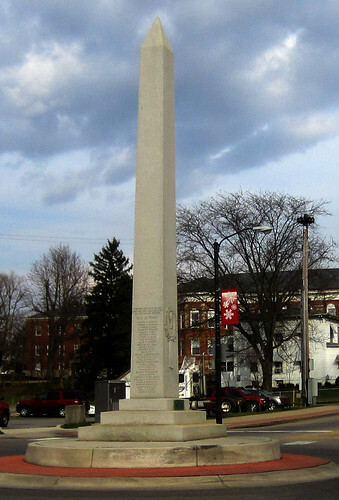 Driving through town, you can't help but notice the monument right in the center of two main streets. On the way out of town, we stopped and I took a picture of the monument and inscription. 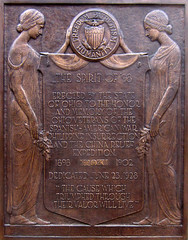 During World War I, Morrow County set the record for per-capita purchases of War Saving Stamps. Now that is a remarkable feat! Not just the record for Ohio, but the record for the United States. A number of the homes on High Street show evidence of some prosperity at the turn of the century, but certainly not of ostentatious wealth. The answer is not readily apparent on the Web, either. A mystery for another day, perhaps. 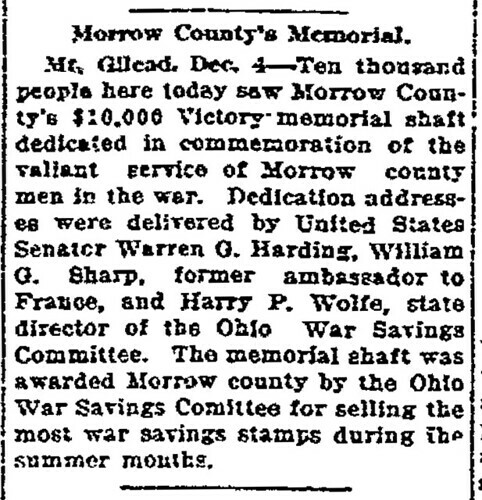 Note that the inscription actually on the shaft makes a slightly more modest claim, more in line with this article from the nearby Mansfield News of December 4, 1919. Still, it must have been quite an exciting day in December with a crowd of 10,000 showing up for the dedication. Licking county enters the final week of the Victory shaft drive a leader in the ninety-day race and hopeful of success. All summer, with the exception of one week when Morrow county nosed ahead, Licking county has been the leader in the state wide race and Ohio has been and still is the leader in the Nation in War Savings Stamp sales. To be sure Licking county now holds a very small lead but that very fact has stirred the workers to renewed activity and has given them a determination to go into the last week of the drive with a vengeance. The prize is a $10,000 granite shaft given by the Barre Vt. granite manufacturers. 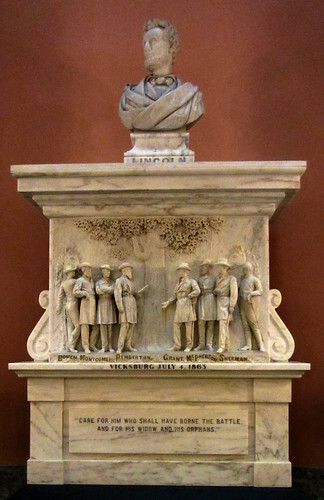 The shaft, though a beautiful soldiers' memorial, is hardly worth the great effort that is being made, but it is not the shaft that the people desire so much as it is the honor of standing first in America. That for which the shaft stands is of inestimable value. To win it will give Licking county a reputation from coast to coast. 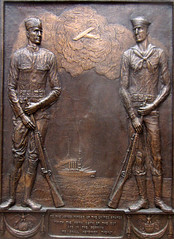 It will be a monument that will commemorate the county's war activity for many years. This county has made a brilliant success in every effort so far and Licking does not intend to fail this time. 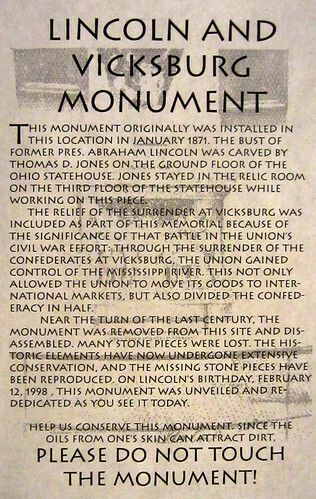 Licking county lost out in the Victory shaft contest, the big $10,000 monument going to Morrow county on her record of a per capita sale of $14.43 as compared with a per capita sale of $10.79 in Licking county, according to announcement made this afternoon by County Chairman C. H. Spencer, who has spent the day at the state headquarters going over the returns with the state committee. We stayed in Athens, home to Ohio University, last night. 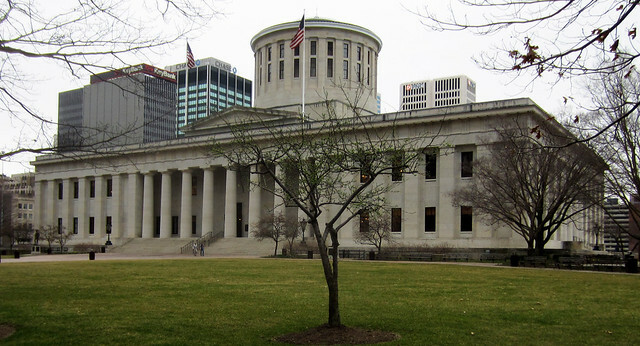 This morning we were off to Columbus, the state capital. Rain arrived in Columbus at about the same time that we did. This is another of the larger capital cities. 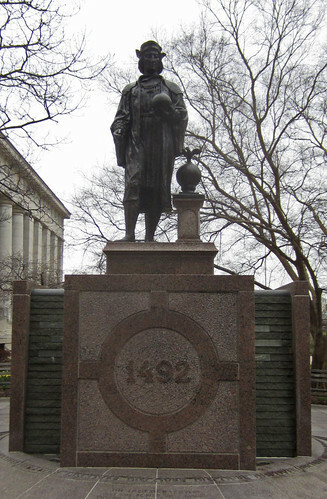 I had never thought about the name of the city, but the first thing that I noticed in the Capitol Square was a statue of Christopher Columbus contemplating the round earth. 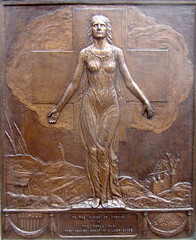 The statue's base has a prominent 1492 on it. The capitol fits nicely into the urban setting. 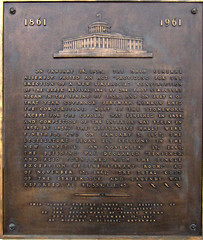 There is plenty of brass statuary surrounding the capitol to stop and view. On the inside, there is quite a bit of Civil War era art. There is a self-guided tour available and there are no metal detectors as are now so common in our public buildings. 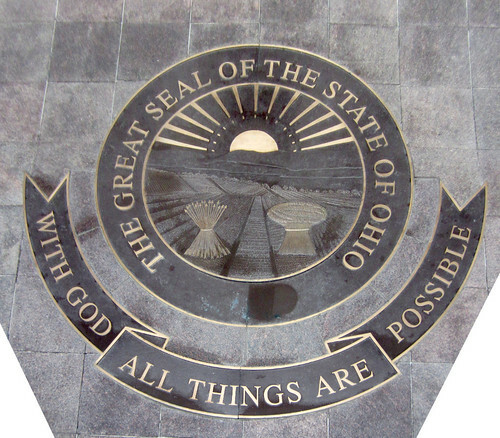 Perhaps, as the state seal notes, Ohio trusts in a higher power. After viewing the capitol, we moved over to German Village, an area of well-preserved homes and shops dating from the late 1800s. The brick and cobblestone streets were accented by some flowering cherry trees. And, no city with public buildings is lacking an "Occupy" movement in 2012. Here are the tents out in front of the capital along with my favorite protest sign. 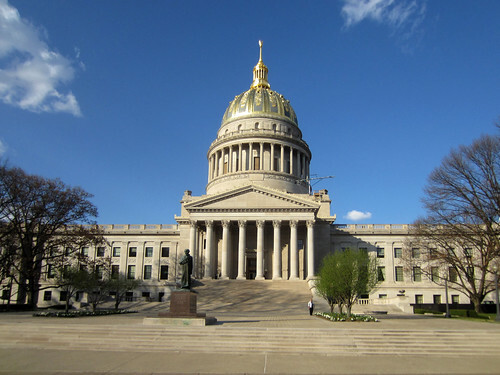 We arrived in Charleston, West Virginia a bit past 5 p.m. A perfect time to catch the sun glimmering on the dome of the state Capitol building. 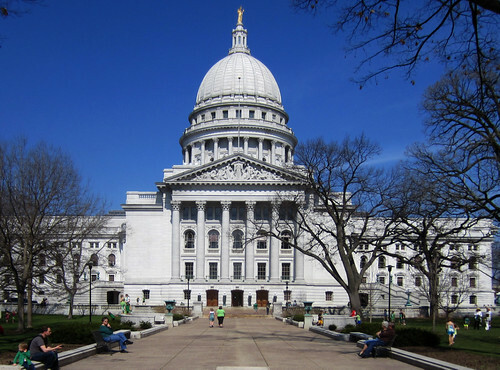 This, like the Minnesota Capitol, is a Cass Gilbert design. And what a setting for a Capitol. Of the nearly forty that we have seen, this one offers the best view. The picture from close up is interesting. 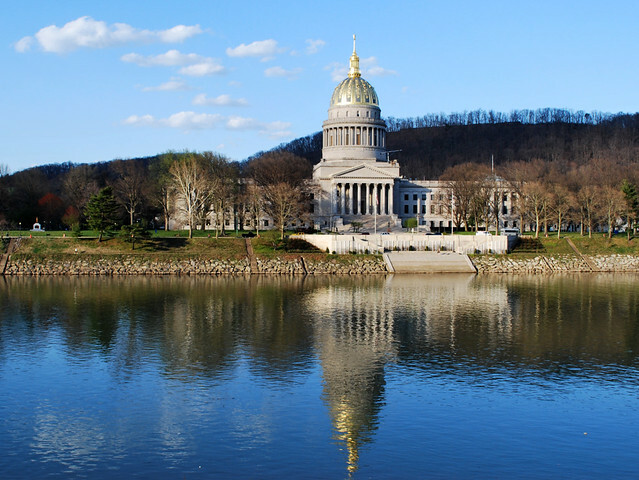 But go across the Kanawha River and take a look. And while you are on that side, go up into the hills and follow Louden Drive. This is a scenic drive that anyone will love. Yesterday was spent visiting with relatives and friends in North Carolina. We started out this morning heading north into Virginia and West Virginia. Our first stop was to get a good look at Pilot Rock before pulling into Mount Airy, North Carolina. If those names seem slightly familiar, it is probably because you used to watch Mayberry, RFD. 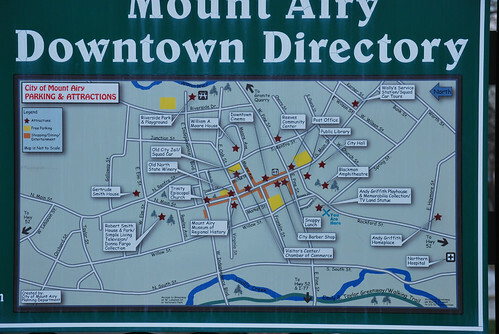 Mount Airy is a real town and was the birthplace and childhood home of Andy Griffith. 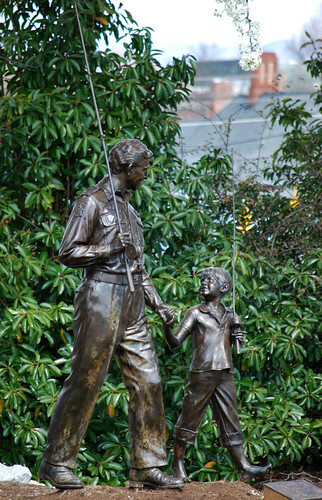 Naturally, there is a museum and an appropriate bronze statue. But the town's roots were in a nearby granite quarry. 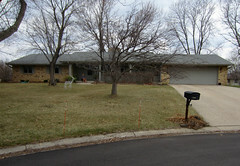 Numerous homes in town demonstrate the wealth that came from that quarry. 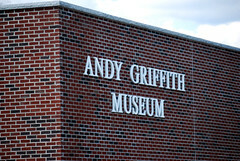 It is worth stopping to take a walking tour of the town near the Griffith museum even if you don't visit it. Pilot Mountain is another of those natural markers that was used for navigation for many centuries. Only much later did it give a name to a town on Mayberry, RFD. A Visit to Bagdad - and Munson too!